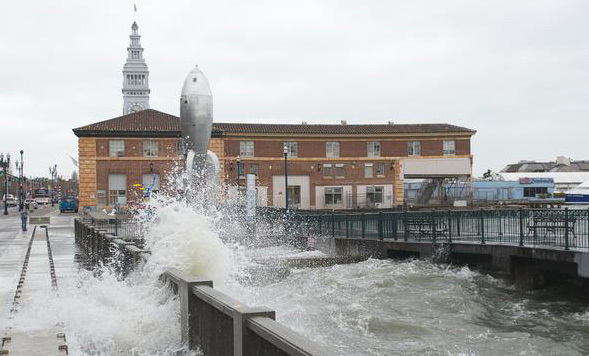 San Francisco — The San Francisco Bay Area has been pummeled this winter by storms packed with moisture from atmospheric rivers. Formed when atmospheric water vapor is pushed across the Pacific Ocean by strong winds, atmospheric rivers deliver much of the Bay Area’s precipitation. The City and County of San Francisco (CCSF) is partnering with experts from Lawrence Berkeley National Laboratory (Berkeley Lab) and Silvestrum Climate Associates to assess how climate change may influence the intensity of atmospheric rivers and associated precipitation, and how those changes may impact San Francisco and its infrastructure. Berkeley Lab climate scientists Christina Patricola and Michael Wehner will leverage a computing method they developed, published, and previously used to study how climate change affected Hurricanes Maria, Katrina, and Irma and a 2013 Colorado storm that caused record flooding. In their collaboration with CCSF the researchers will take a similar approach, using climate models to first simulate historical storms that severely impacted the Bay Area, and then predict how increased greenhouse gas concentrations may alter similar storms in the future. “We will consider the two main types of Bay Area storms – atmospheric rivers and mid-latitude cyclones – because it is possible that climate change may influence the two storm types differently. By considering both, we can provide a more complete understanding of how climate change may influence precipitation in the future,” Patricola, a research scientist in Berkeley Lab’s Climate and Ecosystem Sciences Division, said. Current state-of-the-art long-term climate simulations are approaching resolutions of 25 kilometers, which can broadly represent atmospheric rivers. However, even at 25 kilometers, climate models struggle to represent the magnitude of extreme rainfall events and fail to distinguish between the bay and the peninsula, including its terrain. Advanced supercomputers at the National Energy Research Scientific Computing Center (NERSC), a Department of Energy Office of Science user facility at Berkeley Lab, allow Patricola and Wehner to produce climate simulations at a resolution of 3 km, which is more suitable for representing intense rainfall rates and provides precipitation data at a resolution more appropriate for local decision makers. They have developed a high-resolution “hindcasting” method that allows them to quantify how climate change may modify the intensity of extreme weather events. A 2018 study by Patricola and Wehner, which was supported by the DOE Office of Science, showed climate change intensified the amount of rainfall in recent hurricanes such as Katrina, Irma, and Maria by 5 to 10 percent. A study the previous year found that climate change substantially enhanced rainfall during the 2013 flood event in Boulder, Colorado, which washed away 500 miles of roadway and 30 bridges. Patricola and Wehner will approach their analysis of Bay Area extreme precipitation using similar methods. San Francisco is home to the country’s seventh busiest airport and a 100-plus year-old seawall standing between the waterfront and the bay. Anna M. Roche is a Project Manager for San Francisco’s Public Utilities Commission who is involved in CCSF’s efforts to better understand how extreme precipitation due to climate change may affect the Bay Area. CCSF, according to Roche, stands to benefit from climate simulations that are produced at a resolution of 3 km versus 25 km. “Our high-resolution models will allow us to represent the extreme rainfall rates that impact the San Francisco Bay Area. That’s very important to making reliable predictions about what extreme weather could look like under climate change,” she said. This work is partially funded by the City and County of San Francisco. Computational time at NERSC is supported by the DOE Office of Science.